Remote testing environment is a hat designed for Orange Pi Zero board which runs specially crafted Linux distribution using the Yocto Project. We developed rte to enable programmers from around the world in low level firmware development without hassle of heavy KVM switch interface. In result we have tool which makes easier work with firmware debugging tasks. Industrial applications are very custom. Sometimes it is hard to reproduce environment out of the factory floor. Because of that we are offering the ability to connect rte which in secure way exposes hardware interface for firmware developer expert who can solve issue for our custom configuration. It may happen that our device has to support set of peripherals that came from various off-shore vendors. Those peripherals may have different behavior. It happens a lot that we want to make sure that the one we choose will work correctly over a long period of time. Performing thousands of power state cycles or hot plug events is problematic. We solve that by using rte. Measuring of performance data takes time and requires good framework for execution and gathering data. This problem was already resolved by projects like Phoronix Test Suite. rte can deploy and schedule almost any testing framework as well as make sure that the results are correctly saved on dedicated storage. 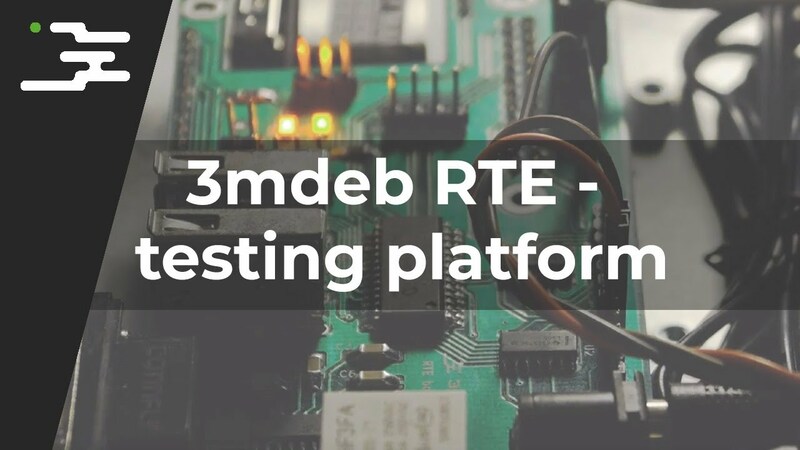 3mdeb is Poland-based company providing consulting services in area of embedded systems. We focus on solving key problems of Internet Of Things market, which are keeping ﬁrmware secure and up to date. We are passionate about building ﬁrmware that enables advanced hardware features in modern products. Our goal is to provide cost effective, reliable, delivered on-time and as much as possible open solutions. 3mdeb started in 2014 as side project and in 2015 was officially registered. In our short history, we were able to become official consultant for coreboot Open Source BIOS and get approvals from leading hardware vendors to obtain conﬁdential documentation in area of security and reference designs. Also, we were lucky enough to work close with 2lemetry Thing Fabric, which was acquired by Amazon and lay ground for building AWS IoT service. This leads us to be leaders in embedded systems integration with AWS IoT. Learn more at our website, LinkedIn, Twitter, YouTube or Facebook. Visit 3mdeb stand at hall 3-563!